Full Tilt Poker Bans Cheats Using Bots!...Should We Laugh? Well, what are they supposed to do...invite them to play? Come on, man, gimme a break. I guess in their emails to suspected or alleged poker bot cheats, they said something like "We are sorry but we are banning you for using a bot to cheat our online poker games..."
In any event, you can read a full article on this at Poker News Daily. "Full Tilt Poker, the world’s second largest online poker room, sent an e-mail to an unknown number of recipients last week regarding the measures being taken to improve its security, according to PokerTableRatings and other outlets. The e-mail informed players that the site had completed an investigation that found several users in violations of Full Tilt‘s Terms of Service, some of whom were discovered cheating through the use of bots. Each cheater had their account shut down and all of their funds were confiscated. Additional details of the incidents remain minimal, as Full Tilt didn’t disclose the number of accounts that were shut down or how much was seized, but the site promised that any players affected by the cheaters would be reimbursed for their losses. A poker bot, for those unaware, is a form of software that registers for games and multi-tables without the assistance of a user. They’re mostly used in cash games, but have also been found in sit and gos, where the software uses Nash Equilibrium and an ICM calculator to make optimal moves against opponents. Most of the major online poker rooms have made concentrated attempts to prevent the use of such software. In July, PokerStars cracked down on a bot ring based in China that had played at least eight million hands and earned $57,000 at Double or Nothing sit and gos. Full Tilt has also been in the news involving bot use in the past. In October 2009, two customers who had their accounts frozen because Full Tilt believed they were using bots sued the site. Lary “pokergirl z” Kennedy and Greg Omotoy filed their complaint on October 1st and levied accusations of fraud, libel, slander, false advertising, and racketeering against the online poker room after having more than $80,000 confiscated. The suit accused Full Tilt pros Chris Ferguson and Andy Bloch of creating bots to populate slow cash game tables on the site and increase the profits of the company. Full Tilt responded to Kennedy’s lawsuit by claiming the suit was baseless and stated that it “has never knowingly allowed ‘bots’ to play on its site.” The case went to the United States District Court for the Central District of California in April, but it was dismissed by Judge Margaret Morrow, who stated that Kennedy had failed to “detail many portions of her case regarding state violations and, in particular, there could be no claim under the RICO Act.'" Online Poker Cheat Collusion Victim Brings Lawsuit Against Six Well-Known Online Poker Players in Bizarre Case! A Florida resident by the name of Scott Crespo has made the headlines recently, after filing a complaint on the 12th October against six well-known online pros at the US Northern District Court of Illinois. In his lawsuit he is attempting to recover “illegal poker gambling losses” while accusing the players, amongst other things, of colluding with each other and cheating opponents on the internet. Scott Crespo is seeking to recover triple the amount lost to the group incurred over approximately 700 tournaments on major US sites, and the names of the players cited in his filing have raised a few eye-brows as it includes a talented group of pros. 6; Tyler “puffinmypurp” Reiman with $2.9 million in online winnings and $1.9 million from live events. As this bizarre case gets going, apparently the Poker Players Alliance (PPA) are already considering throwing their weight behind the accused players. I will continue to bring you updates to this story as they occur. My take: Well, in spite of the Poker Players' Alliance support for the accused, I think this guy Crespo has got a case. God for their jugulars, Scotty! Tom Dwan has received $300,000 in compensation related to the superuser cheating scandal which took place at Ultimate Bet between January 2005 and December 2007. Tom “durrrr” Dwan started playing at Full Tilt in early 2007, eventually becoming a sponsored pro at the site in November 2007. However, before then one of the other poker rooms the online prodigy had played at included Ultimate Bet while it was in the midst of its infamous superuser scandal. Just to recap, following his 1994 WSOP Main Event win Russ Hamilton worked as a consultant for Ultimate Bet. He then went on to organise a scam which allowed himself and a team to view their opponents’ hole cards, eventually cheating customers out of around $22 million. 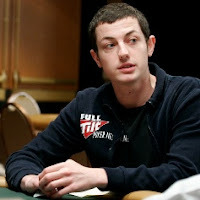 It would now appear that Tom Dwan was one of those unfortunate players to have been scammed and so received the $300,000 refund from Ultimate Bet by means of compensation. Recalling the exact session which led to him dropping around 20 buy-ins at $50/$100 PLO, Dwan said; “I guessed there was a 2% or 3% of some cheating going on.” However, his good friend and fellow pro David Benefield said he believed during that session the cheating percentage was probably nearer to 10%. Tom Dwan’s $300,000 compensation represented just a small fraction of the $22,100,000 eventually refunded to the defrauded players. But I believe it is the largest to date. AS we move deeper and deeper into the online poker era, the online poker cheats are continuing to adjust their cheating ways and develop new methods of trying to cheat you at the online poker tables. During the first few years of online poker, the cheating was dominated by simple collusion play, sometimes by two online cheats and others by groups, some of which consisted of eight or nine players taking down one single cheat victim. As the technological advances enabled the development of more sophisticated poker bots with artificial intelligence, their use naturally progressed with the progress (pardon the pun). And just as naturally, the colluders and the botters in many cases joined forces to form monster online poker cheat teams that used their bots in collusion to get your money. For purposes of this report, I am going to break down the current online poker cheating methods into both individual and combined methods to give you an idea of just how much of which form of cheating you're either up against...or participating in. Note that this study reflects all online poker games including tournaments. Singapore Casino Cheating Beat Goes On. Pair Face Nearly 100 Casino Cheating Felonies! Hold on! Don't get too excited reading this. It all boils down to two guys ripping off Resorts World Sentosa Casino for thirty grand by stealing chips off tables and cheating at roulette. One of the accused cheats, a twenty-three year-old Malaysian dealer named Ng Wuey Kiang, supposedly controlled the roulette wheel by making soft spins that would make the spinning ball land on his cohort's numbers more often than fair probability would dictate. That cohort has been identified as thirty-nine year-old Chinese national Leong Teck Leong. Leong is accused of corrupting Kiang into cheating his casino from the inside, by both stealing chips and manipulating the spins on roulette wheels. I can't say how efficient Kiang was at controlling the roulette ball. This is very hard to do unless the dealer makes obvious weak spins with few revolutions of the ball. The total of the thefts of casino chips was roughly $1,500 and was carried out on seven or eight occasions, according to Resorts World Sentosa personnel. The roulette cheat moves garnered from $175 to $1,750 a pop. All this has added up to nearly one hundred charges, and the bails on both cheats are steep. Leong is being held on $70,000 bail, Ng $100,000. Pre-trial is set for December 2. Both men face several years in prison. My take: The sheer audacity of these casino cheats working Singapore really strikes me. None of these cheats appear to be even close to good or professional...So, what does that say about the surveillance and securtiy forces of both Singapore casinos?...Not much.